Have been to Corfu and Crete but never been to mainland Greece. How do you get there and what are the prices for hotels? Mainland Greece has more to offer (in my opinion) than the islands do. There are two major airports in Athens and Thessaloniki. 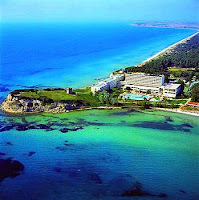 The area I talked about in the post is called Halkidiki and is about an hour's drive from Thessaloniki airport. Prices are similar to the islands, but it all has to do with how luxurious you want your accomodations to be. I have not explored southern Greece as much so I don't know any significant mainland locations down there apart from Athens. You might also want to look at Litochoro (the village at the foot of Mt. Olympus) and Pilio (a mountain with a series of villages overlooking the sea). Both areas combine mountain and seaside holidays (which is great when you want to sleep at night and the temperature drops to comfortable levels in the mountain), there are restaurants, bars and clubs to be found, and there is a regular bus service to take you from the mountain to the sea if you don't drive.